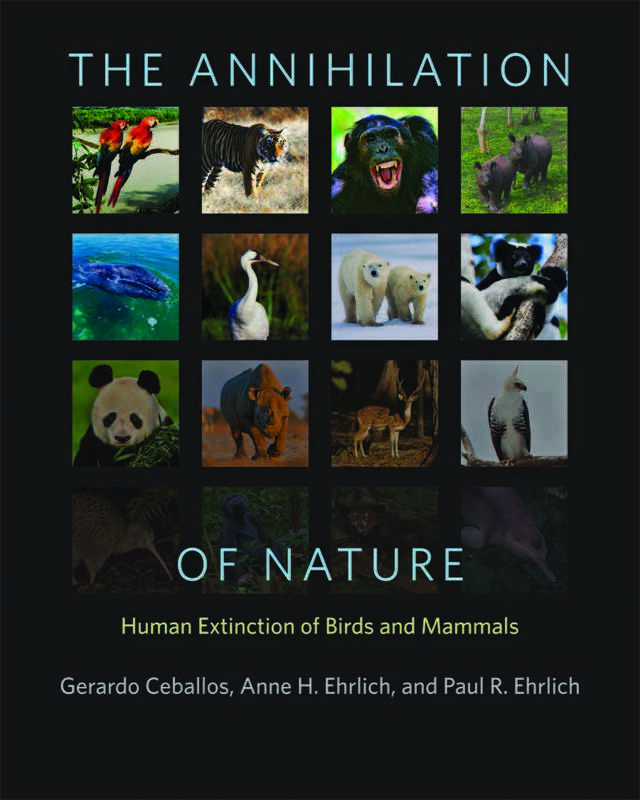 That’s how Salon introduced an excerpt recently posted from The Annihilation of Nature: Human Extinction of Birds and Mammals by Gerardo Ceballos, Anne H. Ehrlich, and Paul R. Ehrlich. The excerpt originally appeared on Earth Island Journal, and you can read it on Salon here. Use promo code “HDPD” to receive a 30% discount when you order your copy of this important book. Guest post by Andrew E. Derocher, Ph.D.
February 27 is International Polar Bear Day but it’s a safe bet that polar bears throughout the Arctic aren’t paying much attention. 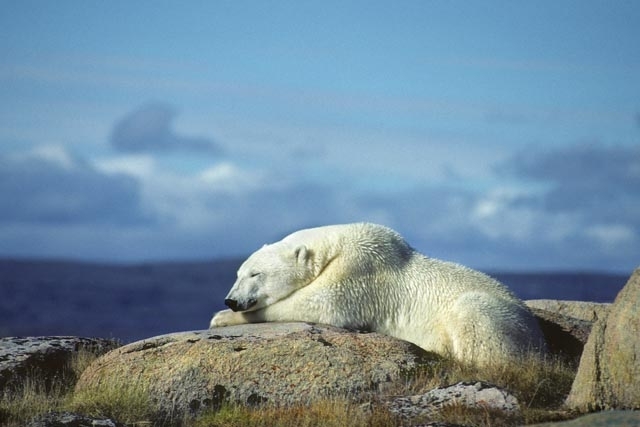 Snoozing Polar Bear. Photo by Wayne Lynch. Nonetheless, any bear living at the northern reaches of land near Ellesmere Island or northern Greenland might be celebrating: celebrating the return of the sun. Given that the polar bears in this area have been living without seeing the sun for over four months, it is likely a welcome sight. For some polar bears, the return of daylight won’t mean much—being buried under snow in a den with tiny cubs doesn’t lend much time to poke about outside. Further, the frigid temperatures keep mothers and their newborn cubs locked up as the cubs are still too small to leave the shelter of their dens. Den departure day will come in April or May—just in time for ringed seals to have their pups and the annual polar bear feast to begin. Ringed seals will start pupping in their own snow shelters above the sea ice but below a thick layer of snow. The pups make a welcome snack for the hungry bears, but the real reward comes from catching adults. The pupping season provides a bounty that makes being a polar bear possible. The spring is the most important foraging period of the year and the bears will gorge themselves on huge meals of seal blubber. A polar bear can easily consume 20 percent of its body weight in a single meal: for an adult male, a meal this size would be roughly equivalent to eating over 200 blocks of butter. That might sound a tad fattening, and it is. Of those 200 blocks of butter, the equivalent of over 190 of them are going to be sacked right onto the bear. 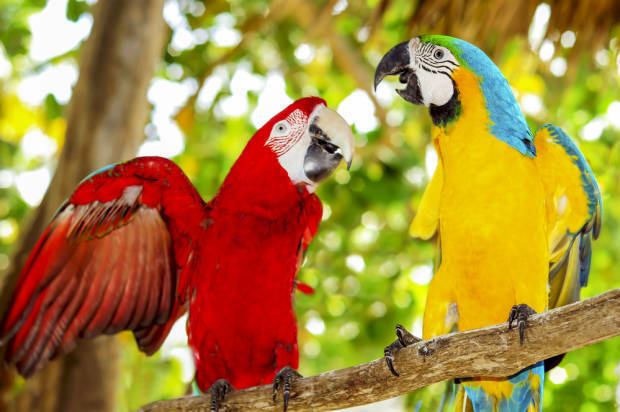 For females that will be mating in the next few months, fat is where it’s at and while they’re only about half the size of an adult male, they’ll be needing a huge store of fat. Some females triple their weight over the spring. In some populations, pregnant females will live off their fat stores for 8 months and eat nothing. While we visualize the most fit humans as those lean and muscular archetypes, the most fit polar bear female is the most Rubenesque. No polar bear ever looked at its reflection in the ocean and thought “I’m too fat.” It must be nice—especially when polar bears seem immune to the effects of a high-fat diet. Clearly, omega-3 fatty acids are a bit easier on their system than butter is on ours. Sweet potato fries cooked in seal fat, anyone? February 27 is a day to ponder the amazing world of the polar bear but more importantly, it is a perfect time to reflect on our own carbon footprints. For more on International Polar Bear Day, visit the Polar Bears International website. Andrew E. Derocher, Ph.D., is the author of Polar Bears: A Complete Guide to Their Biology and Behavior, now available from JHU Press. He is a professor of biological sciences at the University of Alberta and has studied polar bears across the Arctic for the last three decades. Featuring full-color photographs by internationally renowned wildlife photographer Wayne Lynch, Polar Bears provides a deliciously visual and readable account of this most amazing Arctic denizen.